Welcome to the San Carlos Institute's website. 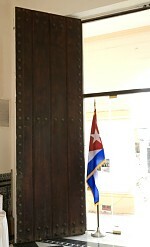 The San Carlos Institute stands as a monument to the perserverance of the Cuban people in their quest to free their homeland and preserve their culture. Founded by Cuban exiles in 1871 as a patriotic and educational center, it was subsequently destroyed by fire in 1886, demolished by a hurricane in 1919 and condemned in the 1970's due to the abandonment and structural decay. Like the Phoenix, however, each time its end seemed near, the San Carlos has risen to new heights to resume its epic role in the history of the Cuban people. After being closed down for almost two decades and coming close to demolition, a beautifully-restored San Carlos reopened in 1992 as a multi-purpose facility that serves a museum, library, art gallery, theater and school. Today the San Carlos glows brighter than ever welcoming thousands of visitors annually. They come to learn about the Institute's history or attend the outstanding programs, exhibits and lectures that are offered throughout the year or just to marvel at the beauty of the building's architecture. The San Carlos Institute is named after Cuba's Seminario San Carlos, known for its academic excellence. It is founded on the principle that education is an essential component for a people to attain their freedom and that the function of the state is to facilitate the means for each individual to achieve his or her potential. Since 1871 children of all races, creed and economic status attended classes together at the San Carlos Institute where classes were taught in English and Spanish. The San Carlos thus became one of the South's first bilingual and integrated schools. In its programs and activities the Institute seeks to raise the level of political discourse with respect to Cuba through the power of education and reason. We aspire for the establishment of a Cuban republic dedicated to respecting the dignity of the individual and a people's right of self determination. These are timeless values that edify the human spirit and give the San Carlos universal appeal. The San Carlos Institute holds a special place in the hearts of the Cuban people. The cradle of Cuba's independence, the San Carlos embodies ideals and aspirations that are as relevant today as when the Institute was founded. Jose Marti united the exile community at the San Carlos and from its balcony launched the final phase of his campaign for Cuba's independence. Marti so loved the San Carlos that he called it "La Casa Cuba." For Cubans and their descendants a visit to the San Carlos takes on a very special meaning. It is a place of pilgrimage and spiritual renewal. Cuban parents bring their children to the San Carlos to learn about their history, take pride in their heritage and gain confidence in their future. The San Carlos has truly become a spiritual home for the Cuban people and a shrine for freedom-loving people everywhere. More than just a building, the San Carlos is a precious legacy, a fortress of freedom, a beacon of hope. It is a torch that has been passed down from one generation to the next for the past 135 years. On behalf of the Institute's board of directors, I invite you to visit the San Carlos and become involved in its activities. We must preserve this historic landmark so that it can continue to light the way for future generations. Thank you for visiting the San Carlos website. We would greatly appreciate your comments and suggestions.